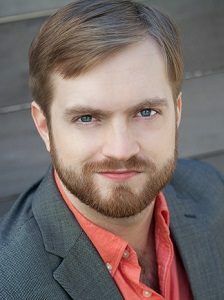 Alexander Boyd “melded a firm baritone with moody acting” (Classical Voice America) as Moruccio, in Sarasota Opera’s production of the rarely seen D’Albert opera, Tiefland. Last year, he made his international debut in Cyprus as King Melchior in Amahl and the Night Visitors with Kyrenia Opera. On the more modern side, he played the role of Jensen in Jeeyoung Kim’s revival of her 2012 opera, From my mother’s mother, performed in The Little Opera Theater of NY’s double bill of Carlisle Floyd’s operas Slow Dusk and Markheim, and also performed selections of Joel Feigin’s operas in concert, each with the composer in attendance. Mr. Boyd took second place in the New York Lyric Opera Theater’s 2016 vocal competition, and subsequently sang Scarpia in their Tosca. On the west coast, he “sang with stentorian tones” (Opera Today) for Pacific Opera Project’s double bill of Josh Shaw’s English libretto set to Mozart’s The Impresario, and Salieri’s hilarious Prima la musica, e poi le parole. As a young artist, he performed Mr. Gobineau (The Medium) with Opera Maine, Haly (L’Italiana in Algeri) with Sarasota Opera, and Prince Yamadori (Madama Butterfly) with Prelude to Performance. This season, Mr. Boyd “gave Le Dancaïre the proper mix of menace and mirth” (Sarasota Observer) in Carmen at Sarasota Opera, performed Count Almaviva (Le Nozze di Figaro) at the Aaron Copland school of music, and gave a recital of arias for the Brooklyn Public Library. Upcoming engagements include performing the Knight of the Mirrors (Man of La Mancha) with The Muses Project in Arkansas, and singing Donner and covering Wotan (Das Rheingold) with Pittsburgh Opera Festival.